Christie 4K 3DLP projectors are being used for the largest permanently installed indoor projection mapping attraction in the United States at the Grand Hall in St. Louis Union Station. 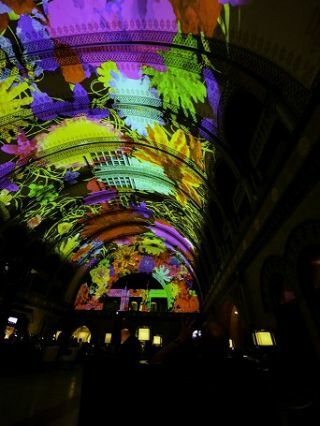 “The Grand Hall Experience at Union Station,” the projection show which takes place in what was once the world’ largest train station, was created by Technomedia Solutions. It won the Themed Entertainment Association's Thea 2015 Award for Outstanding Achievement – Live Show, Limited Budget and the IAAPA Brass Ring Award for Excellence. The light show spans the hall’s 65-foot vaulted barrel ceiling and two curved walls using a 10.1 surround sound system, LED accent lighting, an automated control system, and multi-media content. “We wanted to honor the space and wanted to make sure that what we created wasn’t just a layer on top of that but really blended in very well into the architecture,” said John Miceli, President and Chief Creative Officer, Technomedia Creative & Mood technologies. “Sprites” project around the room at random intervals to bring the space to life slowly as the room transitions from daylight hall to a controlled light theater hall. Each show consists of three to ten custom-produced vignettes ranging from local historical facts and the local sports teams, to the Mississippi River, and the “3D visual wonder & illusion” pieces Narration is provided by St. Louis native actors John Goodman, John Hamm, and sportscasters Bob Costas and Joe Buck. Along with LHM, Technomedia’s collaborative team, led by Miceli and assisted by project manager Drew Atienza, worked to transform the venue, which included positioning the projectors on a custom platform to preserve the views of the architecture.